Justice Kennedy Retires, July 31. Turns out the son of the guy Trump's nominating has some ties to Trump himself as head of the bank that lends the most to Trump's businesses. Regardless of if whether or not there is actual collusion on this nomination it does look like a new form of emperors nepotism. In short. I agree with Dan Rather. NO Besmirching! Turns out the son of the guy Trump's nominating has some ties to Trump himself as head of the bank that lends the most to Trump's businesses. 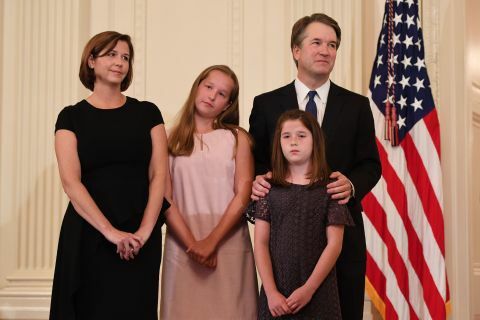 Kavanaugh doesn't have a son. He does have two daughters, and, though I'm not intimiately familiar with their biographies, I don't think either of them is bribing the president through the bank they run. I think Spam was mistaken in what she said but was likely meaning to refer to reports that Anthony Kennedy's son has business connections to Trump. I haven't looked at any of the articles about that so I don't mean to assert that there is anything nefarious or untoward going on, but I do recall seeing headlines and/or comments elsewhere to that effect. I've read a few articles. I honestly don't see where they're going with this as Kennedy's son hasn't worked there in almost 10 years and was never the head of the bank. At most it sounds like Trump knows Kennedy's family. I can't see how there's any nepotism to be had, at least not through anything Trump did. But I guess that's how conspiracies are. Add in some Russian smoke and watch the crowd eat it up. How this relates to an octogenarian long rumored to be seeking retirement when a president of his own party takes power actually does so is a little beyond my scope. The Kennedy conspiracy theories are a little too much. I really don't find it unusual at all that Kennedy's son's business life may have intersected with Trump's - whether you agree that it's a good thing or not, it's really just not uncommon at all for the political/financially elite to have interacted with each other. That is exactly why I have never bothered to read the articles on the Kennedy rumors; it doesn't surprise me that there were interactions between the families before and I've also been hearing about Kennedy considering retirement for years. There's a certain percentage of people who are going to believe any rumor or conspiracy theory about the other side no matter what and no matter how insane. I didn't believe conspiracies when that Kenyan was in office. YES OMG! Thanks for Spam interpreting. When I post from my phone I have the worst time. Step 1: Kennedy's son might have done Trump a favor by giving him a loan long before he ran for president. Step 2: Kennedy retires 10 years later. Well yeah, that's why I say discount it in the original post. It's just conspiracy theories but I have long thought that Trump should have fully divested himself so stuff like this doesn't come up. Trump and his family are making a bunch of money now on the tax payers dime. Well it turns out Kavanaugh had high credit card debt because he purchased Nationals tickets for him and friends. Which he then paid back. So un American. Being American would have been to not pay it back and let the accounts go into default. Hard hitting journalism. Yeah. I try to discount a lot of stuff I see. But as a trollish lazy poster I do like to come stir the pot. My credit card tends to go a little high (not that high, but his salary is higher than mine) when I do stillstuff like that with friends. You almost have to have one person buy everything to make sure you get seats together. I actually did that with my Miami Hurricane season tickets for me and my cousin. This much is becoming clearer to me. Most people don't have the first clue about Roe v Wade. A female manager at work a couple of days ago was taking about Kavanaugh and how Roe v Wade was about to come to an end. Now she's a typical "I wouldn't get an abortion myself but I believe in the right to choose person." Now she's afraid that abortions will be illegal and women won't have a say in it. I told her overturning RVW doesn't make abortions illegal, and her response was "That's not what the news said". OMG. I explained to her what RVW was and what overturning it would do. I told her to look it up of she didn't believe me. Curious I asked on of my younger male associates what happens if RVW is over turned and he said that abortions would become illlegal. Watching the fury on television, I'm confident that a good percentage of the population believes this. Ignorance to RVW isn't a bad thing, but being ignorant while getting upset about a Supreme Court appointment is. “The medical judgment may be exercised in the light of all factors—physical, emotional, psychological, familial, and the woman’s age—relevant to the well-being of the patient. All these factors may relate to health." Obviously, the above more or less rendered the whole trimester thing null and abortion became de facto unrestricted until birth. Casey pulled back on that a little, but it's still mostly true. Recall that post-Casey, even a partial birth abortion ban was declared unconstitutional the first time it went through the courts. It was only after O'Connor was replaced that Kennedy allowed even that minor restriction. The thing is, only about 12% of Americans believe that abortion should enjoy no restrictions whatsoever until birth. About 76% believe that it should be restricted after the first three month. Heck, only about 1 in 5 pro-abortion people agree with Roe's policy outcome. We hear all the time how popular Roe is and how people don't want it overturned, but people really have no idea what they're endorsing. I love that we lose our minds over abortion while the US has the lowest birth rate and abortions are actually performed less often now due to education and choices. But you know, let's freak out. Kum-bye-yah! Fozzie put this in the other thread about Nukes so I'll just paste this here. What honeymoon? The only reason anyone has been cordial to Trump at all is because he's extremely popular with his base, and his base is big enough to ensure that no Republican standing against him will be re-elected. Until there are polls showing Trump has taken a substantial hit with popularity among Republicans, nothing really changed. And nothing has changed with Trump over the past week. He's been in love with Putin since at least the campaign, and has been wanting to bully Iran since we'll before the campaign. And that isn't too far off from our stance for decades, except it's on Twitter. Like all Trump resistance, this is a lot of nothing. HAHAHA! I know which thread you meant to put that in. The honeymoon comment was about the first two years where mistakes are expected. Now it's like, hey dude, you should have some of this figured out already and your weird comments like saying WOULD instead of WOULDN'T shouldn't happen now. The medical judgment may be exercised in the light of all factorsphysical, emotional, psychological, familial, and the womans agerelevant to the well-being of the patient. All these factors may relate to health." Arent you speculating when you say people really have no idea what theyre endorsing? As a matter of constitutional interpretation, does people have no idea what theyre endorsing matter? Aren't you speculating when you say people really have no idea what theyre endorsing? Well, a solid 37% of people don't even know Roe is about abortion in the first place. So, yeah, I will speculate that most don't know how radical it was or that they support policies that it prohibits. Sixty-two percent, thats a 6 in front of a 2, know Roe v Wade is about abortion. [M]ost Americans (62%) know that Roe v. Wade dealt with abortion rather than school desegregation or some other issue. Just relying on the statistical number of 37%, I will get into your flawed use of the percentage in a moment, doesnt support your claim of most. And drawing a conclusion about the radical nature of the case from statistical data about knowledge Roe v Wade is about abortion is misplaced. The data point is in regards to knowing Roe v Wade is about abortion, which doesnt hint or suggest any info as to knowledge of the radical nature of the case. Of course, whats also missing is any meaning of the word radical and theres no explication, argument, or demonstration of how Roe v Wade possesses attributes of that meaning. So, yeah you are speculating, as you admit, but what exactly is the point of speculating? Why does any of your points matter in relation to abortion as a right under the 14th Amendment Due Process Clause? What exactly are you suggesting about those people who lose their minds over abortion? 37% is pretty close to a majority already all by itself. In order for those who don't understand the full ramifications of Roe to not constitute a majority, 78% of the remaining people would have to be fully aware. Are you going to make an argument that the country is split so starkly between people who are either totally ignorant or totally informed? I wasn't aware I was making an argument that Supreme Court decisions are beholden to opinion polls. I was responding to Metropolis's post about his co-worker who was misinformed about what overturning it would mean.